By clicking the button, you will enter the Options form. If you have several sound device, you can select the recording device here. Select Recording Type, MP3 or WAV. Select Recording Channels, Stereo or Mono. Select Sampling Per Second, 44100 or 22050. Select MP3 Bit Rate. 32 - 320 kbps. Use system recording volume control window - use system recording volume control window instead of recording volume control window of program. 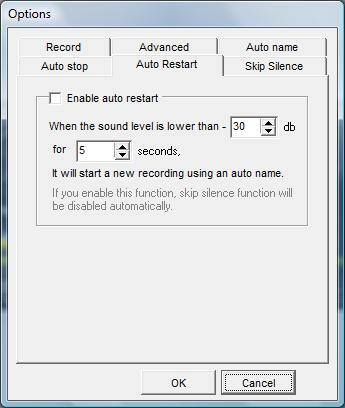 Cause Windows Vista don't have recording volume control window, so this function doesn't work under Vista. 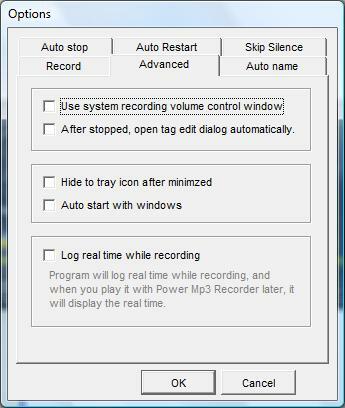 After stopped, open tag edit dialog automatically - after recording finished, tag edit dialog will be opened automatically, this only valid for mp3 or wma files. Hide to tray icon after minimized - After program minimized, hide to tray icon. 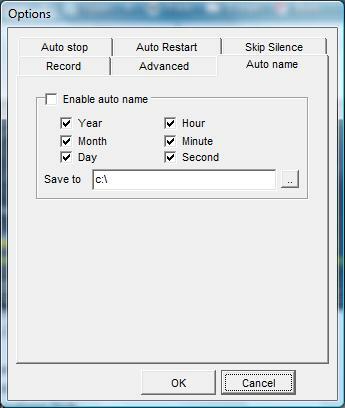 Auto start with windows - auto start program with windows. Log real time while recording - Program will log real time while recording, when you play it later with Power Mp3 Recorder, it will show the real time. After you moved or renamed recorded audio, this function will be invalid. Power Mp3 Recorder will save an additional file with extension .tm to store the real time information. So if you want to move or rename the recorded audio, please do this to the .tm file too. Auto Name function, by enabling this function, it will generate file name automatically according to current time. 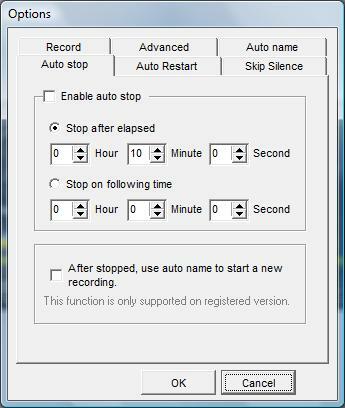 Auto stop function allows you to control the recording stopped at a specific time either after recording elasped or at a specific clock. 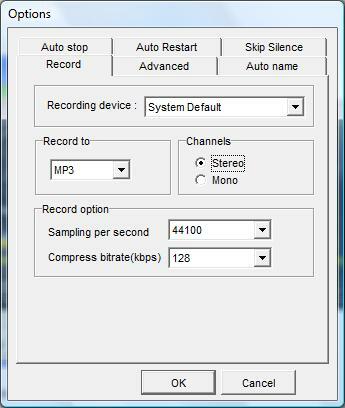 You can also make recorder start a new recording after auto stopped. It is useful when you want to record audio with a same length, for example, you can make recordings every 10 minutes and save them to different files. This function only supported on registered version. If you want to record several songs divided by silence , then this function may be useful, it will create a new recording when it detects a proper silence. However, before using this function, you will need to watch your sound level and set proper values according to the silence length. This function is conflict with Auto Restart function, which means you can enable "Skip Silence" and "Auto Restart" at same time. This function make recorder some intelligent, it can detect sound level while recording, and if it detect a specific long time silence, it will pause the recording automatically, and after any sound detect again, it will resume the recording. 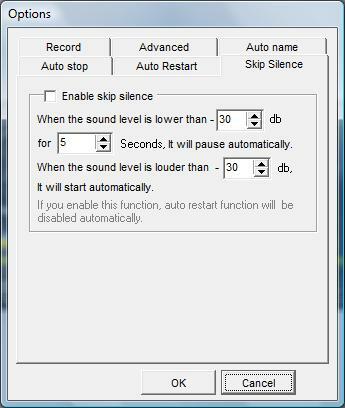 This function is conflict with Auto Restart function, which means you can enable "Skip Silence" and "Auto Restart" at same time.